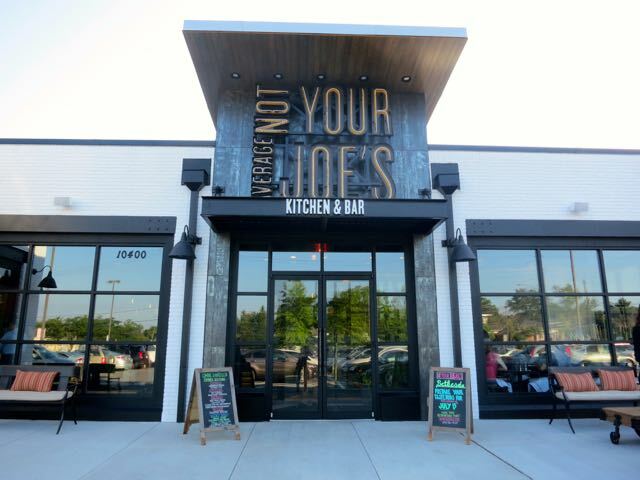 Today Not Your Average Joe's, a New England-based chain restaurant, opens in Bethesda, Maryland as it celebrates its 11th year in business. 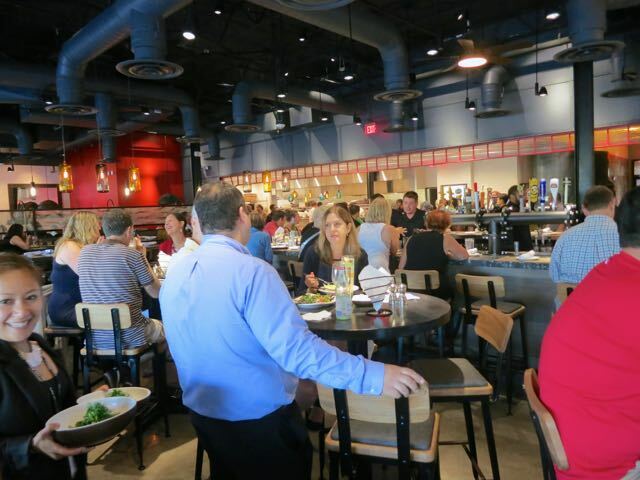 With restaurants in Maryland, Massachusetts, New Hampshire, Pennsylvania, Rhode Island, and Virginia, this chain is quickly expanding. I was invited to preview this new restaurant's menu before its official opening this past weekend. 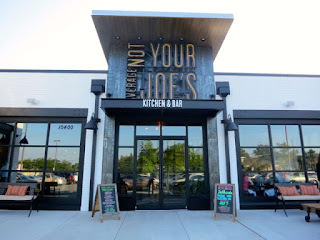 Located on Old Georgetown Road right off of MD-270 near Montgomery Mall, this restaurant is definitely outside of the trendy Bethesda restaurant area. And, it is huge. As soon as you walk in, you will marvel at the sheer size of this 7,000 square foot restaurant that can accommodate 200 patrons inside and 75 outside. We were seated at a booth in the bar area. The black tables and wooden chairs with exposed ductwork gave it a rustic, yet modern feel while the red accents gave the decor just the pop of color it needed. I found it to be a lively atmosphere. 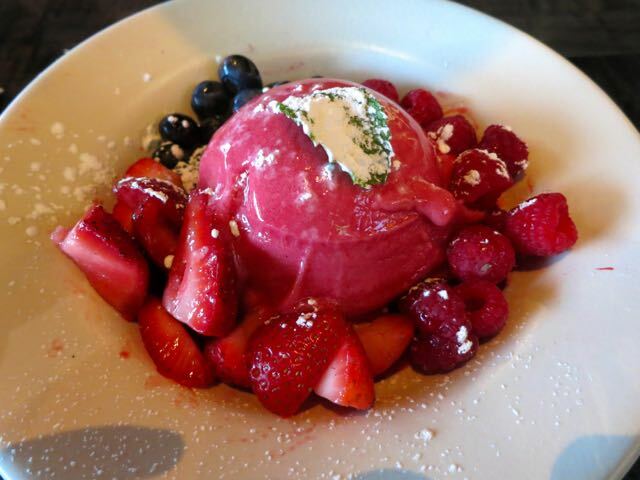 The restaurant is known for its seasonally inspired menu, freshly prepared meals, and accommodating those with dietary restrictions and/or preferences. That said, they seem to be much more gluten-free friendly than vegan friendly as the only vegan item on the menu is an appetizer. while gluten-free diners have a separate menu entirely. The VP of Culinary, Chef Jeff came out to speak to us and let us know what our options were. Even though it is a big chain restaurant, all meals are made-to-order so customization is possible. We ordered some drinks and awaited the appetizers. I have to say that the drink selection is pretty impressive. They have a full bar and a great cocktail menu including one of my favorites -- the Negroni. I went with the Elderflower Sipper -- a light cocktail made with Absolut Citron, elderflower liqueur, lavendar, house-made lemonade, and rose water. It was lovely. 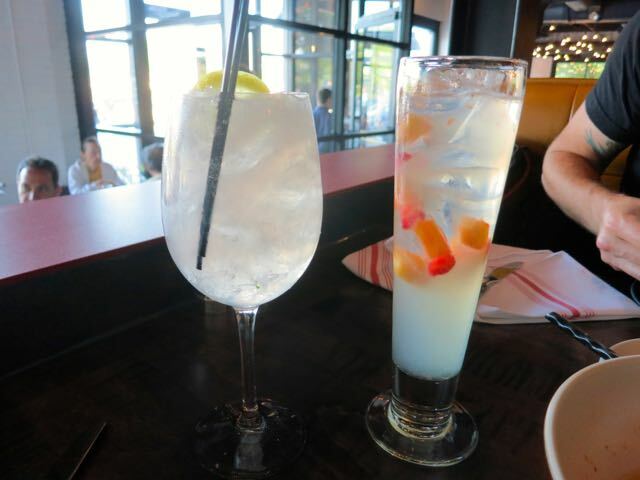 But, equally as impressive was their non-alcoholic drink menu that offered a variety of drinks like Cucumber Mint Spritzer and Pomegranate Fizz. My friend ordered the Baby Peach Bellini made with housemade lemonade, peaches, and soda water. It was fantastic. 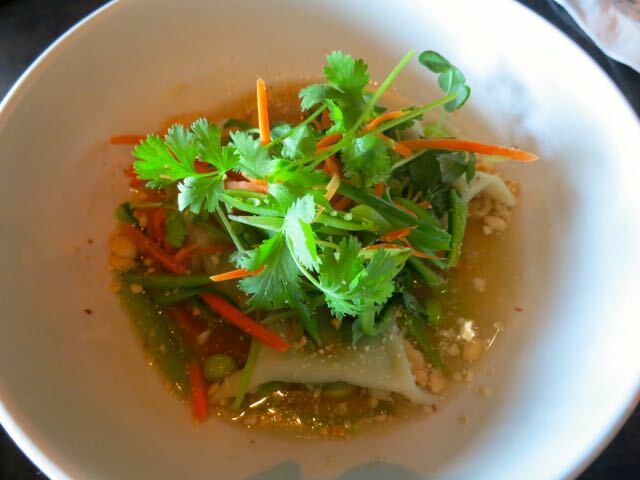 Our first appetizer is the one that is vegan as-is on the menu -- the Edamame Dumplings. Served in a lime-infused chili broth, these dumplings were filled with some sort of edamame mixture and topped with crunchy fresh peas and carrots, peanuts, and cilantro. They were really good. Next up was the Bruschetta without the mozzarella or pesto. 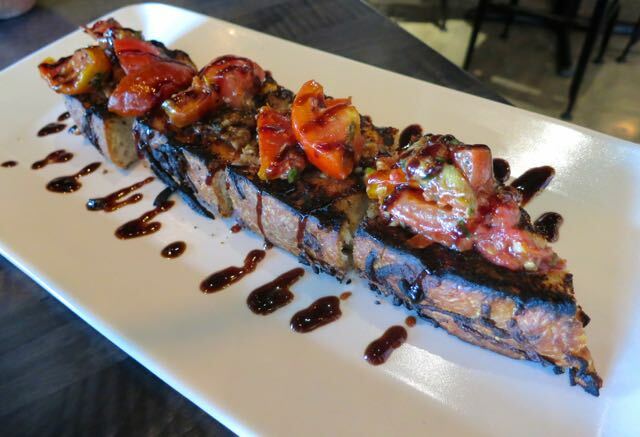 Fire-roasted housemade focaccia was topped with marinated tomatoes and a balsamic reduction. Crunchy, yet savory all in one bite. I couldn't get enough of this appetizer. We could have stopped there because that was a lot of food, but we still had our entrees coming. At this time, it appears there is only one entree that can be veganized and that is the Gluten-Free Green Machine Chicken Penne without the chicken, of course. The pesto has cheese in it so you'd have to request that they make a fresh batch of pesto without the cheese -- FYI. 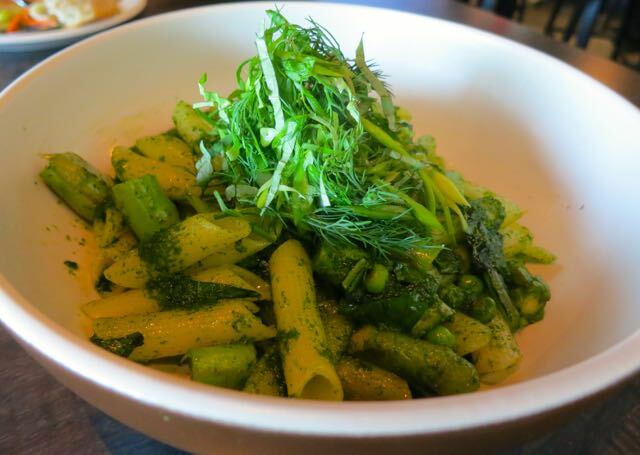 This gluten-free penne is tossed with kale, green peas, and asparagus in an arugula pesto with a lot of olive oil. It was a fine dinner and I loved the vegetables, which were cooked well, but I'm not a big fan of gluten-free pasta because I find it not as flavorful as whole wheat pasta. This one was no different. It was a flavorless pasta tossed in a pesto that needed something else with some great veggies. So I came out feeling about 50% satisfied with it. For dessert, they served us a sorbet with fresh strawberries, raspberries, and blueberries with powdered sugar. Mmmm. Although this dinner was complementary to everyone who dined that night, they provided us with a check so we could see how much the dinner would have been. We were shocked to see it would have been about $70. With $15 entrees, two $8.50 appetizers, an $8 alcoholic and $4 non-alcoholic drink, it seemed pricey for what it was. I felt like that penne would have been better priced at $12 and the appetizers at $6-$7. So, all in all, the service this evening was great, the drinks were fantastic, and most of the food was pretty good, although expensive. I'd probably go here just for those appetizers and drinks if I happened to be in the area. The menu is seasonal and I'm hoping that if vegans ask for it, they'll add a vegan entree to their next menu. That would be great if they did. They say that the chef can work directly with the guest to craft his/her meal so it seems they can accommodate anyone. I'd agree that Not Your Average Joe's is not your average chain restaurant with its fresh made-to-order meals. Check it out next time you are in Bethesda.